Come and see Commercial Loan Corporation at the 2018 Annual PFAC Education Conference. 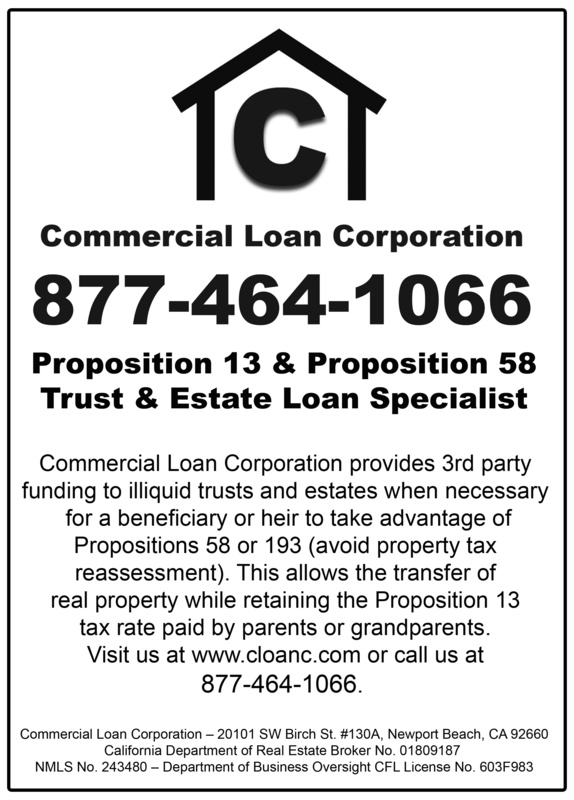 Commercial Loan Corporation will be hosting a booth in the Exhibit Hall. This year the 23rd Annual PFAC Educational Conference will be celebrating the legacy of success of California licensed professional fiduciaries. PFAC is proud to serve this honored profession by providing some of the most comprehensive and current education in the industry, partnering with proven presenters and speakers imparting skills and knowledge that you can put to use in your practice. Commercial Loan Corporation is proud to support this event and if you are attending we will be happy to see you there. The PFAC Educational Conference will be held at the Riverside Convention Center this year on May 30th – June 2nd, 2018. Mike Riggs will be on hand at the conference to answer any questions that you may have on Proposition 13, Proposition 58 and how to best take advantage of the savings benefits with our trust & estate mortgages. You may also visit our Homepage for additional information on our Trust & Estate loans. For additional information on how to find us at the 23rd Annual FPAC Conference or about our specialized loans to trusts and estates, please call us at 877-464-1066.